Using glitter, glue and inspiration, some of the nearly 3,200 Grand Canyon University nontraditional graduates who walked at Friday and Saturday’s commencement ceremonies adorned their caps to showcase their feelings about earning their degrees. 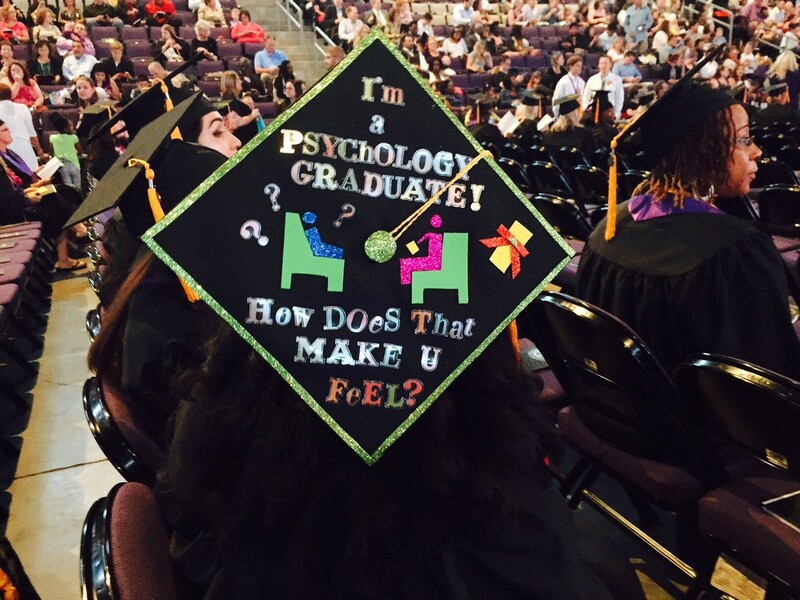 Adrian Bragg of Phoenix, who earned a bachelor’s in psychology from the College of Humanities and Social Sciences, used the words, “She did that, 2015,” alongside an image of a woman’s head and a college diploma on her cap, reflecting the enormity of her accomplishment. Bragg worked full time and cared for her children, ages 10 and 17 months, while working on her degree. She already has started on a master’s degree in industrial and organizational psychology. Graduates in the College of Nursing and Health Care Professions showed humor and art in their mortarboards. One had a long-tailed orange critter with words, “Foxy BSN,” while another modified the Superman logo with BSN beneath a red heart rhythm stretched across. Another future nurse used sparkly beads to form a caduceus, the familiar symbol for medicine with the intertwined snakes on a winged staff. The mortarboard of Stephany Molina-Gerena, a new psychology grad. Stephany Molina-Gerena, a Phoenix resident who earned a bachelor’s in psychology, designed her mortarboard with two figures facing each other in lime-green chairs. “I’m providing therapy to a client,” said Molina-Gerena, who is enrolled in the GCU’s master’s degree program in professional counseling. Click here to see more mortarboards.